"Whatever becomes of this grand old lady, her colourful history will not be soon forgotten. When the Recreation Facilities Committee was formed consisting of Chairperson Ann Currie, Jim Culbert, Steve Boland, Ellen MacKenzey, Bill Germayne and Sharon Sinclair, Director of Parks and Recreation, one of their first commitments was to find the "ideal" location to house the new Recreation and Cultural Complex. After a considerable amount of investigative work and discussion by this Committee, the favorite choice was the old convent. While the convent certainly fits the "centralized" location criteria, an added attraction is the history which surrounds this 112-year old structure. In 1876, John MacLean Stevenson built this masterpiece (named Masonic Lodge) and lived in it a short 10 months before selling it to the Robert Bingham family. This family stay was a little longer (16 years) before it, once again, changed hands. In 1893, James Boddy became the proud owner and renamed the house "Fairview". He resided there until 1903 when the property was purchased by Rev. Egerton Ryerson Young (noted missionary and publisher) who again renamed the house this time she was labeled "Algonquin Lodge". Upon the death of Rev. Young in 1910, his family sold the house to Sam Lukes who ran the Bradford Flour Mill. Lukes pet name for the home was "Luxalean". The house stayed in the Lukes family until Gilbert Lukes sold it in 1949. At the time of this sale, the plot of land was divided in two; on the plot south of the house was built St. Mary's Catholic School. The house was occupied by a group of teaching nuns of the Ursuline Order of the Diocese of London in Ontario. In 1969, John and Maria Moniz bought the stately mansion and turned it into an apartment house. Contrary to the zoning by-laws, Town Council closed their eyes and allowed this grand home to be a multiple family dwelling for 12 years. From the moment John Moniz' sale was accepted by Fred Picavet's cash offer, which in turn, nullified the offer made by the Town's agent, the convent had been cloaked in a shroud of controversy. 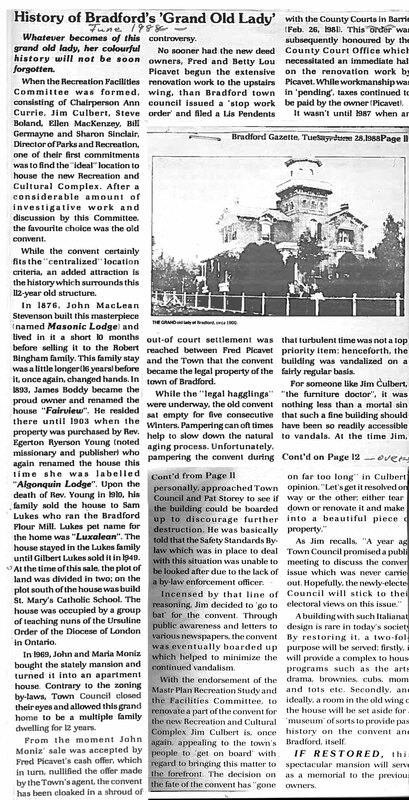 No sooner had the new deed owners, Fred and Betty Lou Picavet begun the extensive renovation work to the upstairs wings, than Bradford town council issued a "stop work order" and filed a Lis Pendents with the County Courts in Barrie (Feb. 26, 1981). This order was subsequently honoured by the County Court Office which necessitated an immediate halt on the renovation work by Picavet. While workmanship was in "pending", taxes continued to be paid by the owner (Picavet). It wasn't until 1987 when an out-of-court settlement was reached between Fred Picavet and the Town that the convent became the legal property of the town of Bradford. While the "legal hagglings" were underway, the old convent sat empty for five consecutive winters. Pampering can oft times help to slow down the natural aging process. Unfortunately, pampering the convent during that turbulent time was not a top priority item; henceforth, the building was vandalized on a fairly regular basis. For someone like Jim Culbert, "the furniture doctor", it was nothing less than a mortal sin that such a fine building should have been so readily accessible to vandals. At the time Jim, personally, approached Town Council and Pat Storey to see if the building could be boarded up to discourage further destruction. He was basically told that the Safety Standards Bylaw which was in place to deal with this situation was unable to be looked after due to the lack of a by-law enforcement officer. Incensed by that line of reasoning, Jim decided to "go to bat" for the convent. Through public awareness and letters to various newspapers, the convent was eventually boarded up which helped to minimize the continued vandalism. With the endorsement of the Master Plan Recreation Study and the Facilities Committee, to renovate a part of the convent for the new Recreation and Cultural Complex, Jim Culbert is, once again, appealing to the town's people to "get on board" with regard to bringing this matter to the forefront. The decision on the fate of the convent has "gone on far too long" in Culbert's opinion. "Let's get it resolved one way or the other, either tear it down or renovate it and make it into a beautiful piece of property." As Jim recalls, "A year ago Town Council promised a public meeting to discuss the convent issue which was never carried out. Hopefully, the newly-elected Council will stick to their electoral views on this issue." A building with such Italianate design is rare in today's society. By restoring it, a two-fold purpose will be served; firstly, it will provide a complex to house programs such as the arts, drama, brownies, cubs, moms and tots etc. Secondly, and ideally, a room in the old wing of the house will be set aside for a "museum" of sorts to provide past history on the convent and Bradford itself". IF RESTORED, this spectacular mansion will serve as a memorial to the previous owners."